Imagine this: an alternate universe, March 08 2018. The White House meeting on video game violence is going full steam. People have already been shocked with a clip containing selected bits depicting scenes of aggression, murder, wearing socks and sandals in public and all other kinds of atrocities. People are shocked, angered. It is clear: games are bad. They are devil’s invention. The audience is beyond confused: how can something so cute exist in video games? Even the president forfeits his attempts to look serious and thoughtful for a moment and lets a squeaky-voiced “awwww”. The defender proudly drops the mic and leaves the meeting like a rapstar off a Grammy’s award. What he would not like the audience to learn, however, is that not all the “violent games” like GTA or Sniper Elite should be avoided. It is actually Ghost of a Tale people should stay away from. I should confess, I went into the game knowing almost nothing about it. There were a few screenshots I saw, I maybe even watched a video of it. From the little I saw, I instantly fell in love with the main character as well as the whole “dark fairytale” premise. Soon after I bought the game I came to learn that in this case looks were more than deceiving. Sure, what got me interested initially is here. 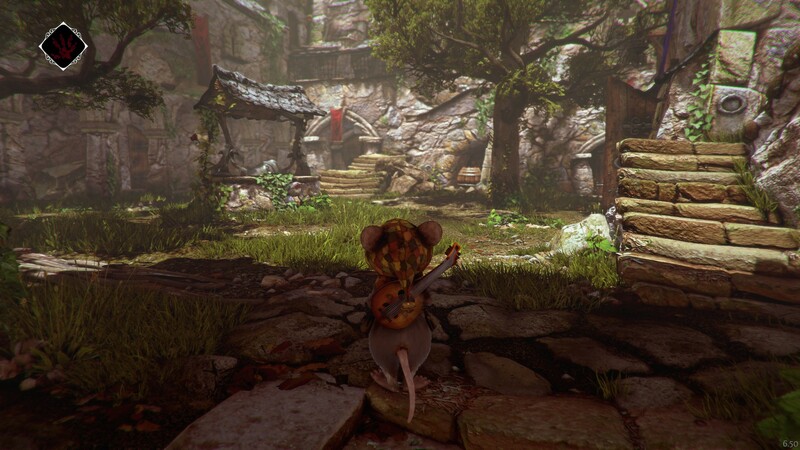 You play as Tilo, an imprisoned minstrel(and the cutest video game mouse ever), who desperately wants to escape and find his missing wife. The world is ruled by the rats and little mice like you are nothing but garbage to them. Not all rats are like that, though, and soon you will find some that are willing to lend you a helping paw. I generally enjoyed the story. Most you it you learn through dialogue, but there are some interesting ingame books and notes as well. Every character you meet is very intriguing in its own way and there are a few options with different dialogue outcome in every conversation. Sadly, said dialogues are not voiced. Given that there is a moderate amount of talking, reading the text can become tiresome for more impatient players. Not to mention, the accompanying “taka-taka” sounds can make even the voice-over in Banjo-Kazooie sound like Oscar winning material. Sandly, I can’t tell you much about how the story goes or how it ends… because I haven’t played the game all that much. It’s just not worth it, man! 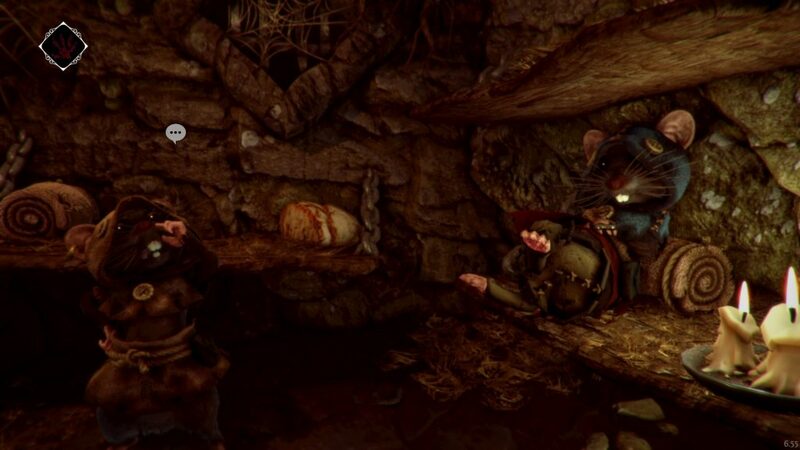 As much as I wanted to like Ghost of a Tale, I regret telling you there isn’t actually much to like, gameplay-wise. The game feels and, what’s more important plays like a PS2 title. Tilo, as cute a it looks, controls very stiffly. You need to be very precise when doing any kind of platforming and oftentimes it’s not clear where you can jump or grab to and where you cannot. Most of the time you sneak around in a few open areas, where “open” is quite loosely used as said areas consist of a number of connected corridors with a few halls and courtyards sprinkled in between. The rats patrolling these levels aren’t going to win any awards in the A.I. department anytime soon either. To put it lightly: they are the “Dumb and Dumber” of A.I. … but dumber.They follow the same path, a few meters long, or will guard(or sleep in front of) the same door day and night, till the end of time. You can bump into them and still have a few seconds before alerting them. And even if they see you, running away and hiding from the guards is usually the easiest thing in the world as in true fictional policemen style, 99% of the cases, they will give up the moment they lose sight of you. There are hiding spots and again, you need to not be seen only for a second to hide… even if the hiding animation is still playing when the guard appear around the corner. Once hidden, the enemies will simply walk away and will never check any containers or hiding places. So so much for any tension a-la “Alien: Isolation”(I know these games cannot be further apart, but still…). 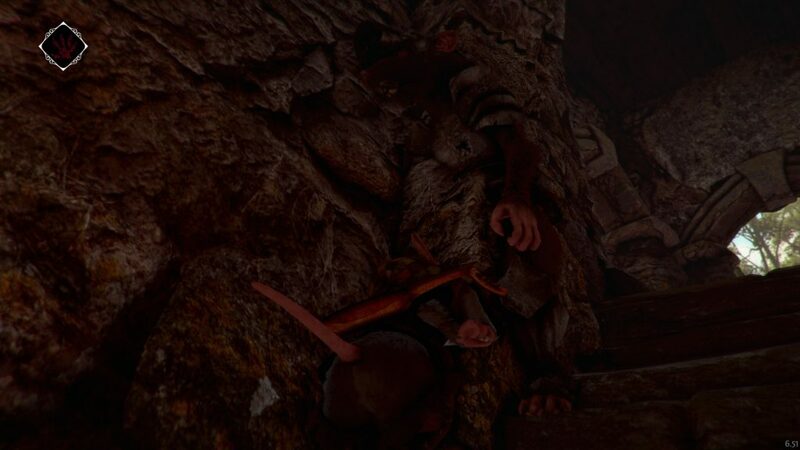 Also, there is no way to kill said rats(at least I didn’t find one in my playtime), you can only briefly stun them by throwing bottles at their heads or using elements in the environment to do so. The worst enemy is always one's self. Unless you clip through a wall. That's worse. When not dodging baddies you will search for different items placed in the world. You will need to collect the pieces of a set of armor in order to gain access to a different area. You will need to find checkpoint passes in order to help a band of thieves escape. There are also roses to be found and bugs as well. In other words: fetch quests, fetch quests galore! If I don’t sound all that excited, well that’s because I ain’t! The game is basically this: an item hunt. Find this, find that… while avoiding or running away from the stupid(in every sense) guards. Oh, and there are keys to find, too. The key for the Weeping door, the key for the Armory door, the footlocker key. So, you first find the locked door/cupboard/chest. Then you have to remember where said door/cupboard/chest is. You most probably won’t. So you go all around the level over and over again until you find the key for the door/cupboard/chest. Then you need to find the door/cupboard/chest again, as most probably you forgot where it was. If this sound tedious, well because it is. It was in Quake 2, 21 years ago, things haven’t changed much since. Also, the graphics make finding these items even harder. There are some great sights, mind you. Tilo looks awesome and is nicely animated, so are the other creatures you stumble upon. There are also some great looking parts in the environment. Most of the textures, though, are very mudled, especially the interiors, even in the highest settings. The objects are not as sharp as they need to be and this is not only a question about aesthetics, as it makes the usable objects hard to discern from the background. 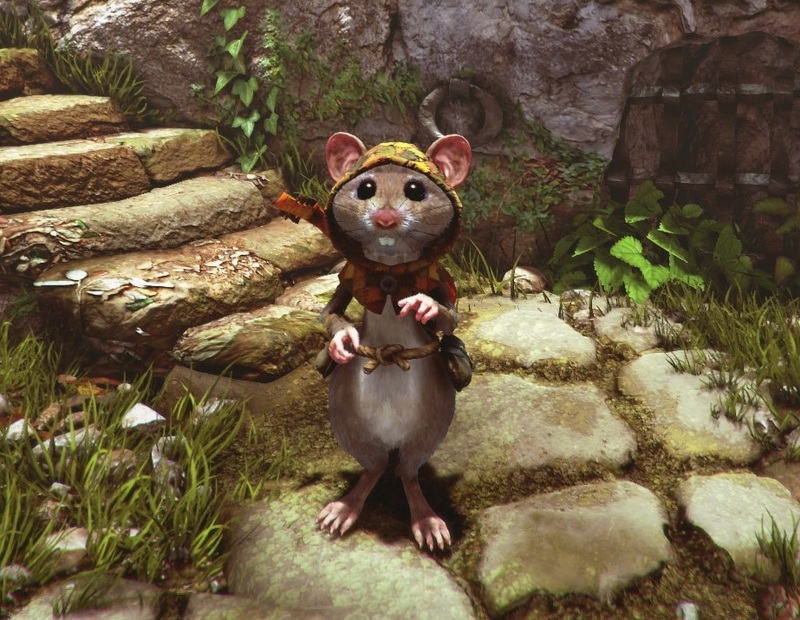 I think, it’s important to say this: I have only 5 hours of gameplay time in Ghost of a Tale. I know it seems very little and who knows, maybe the game picks up later on. But think about this: it took mere 5 hours for the game to make me hate playing it. 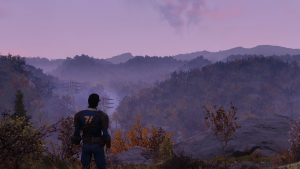 If a game is not able to hook you up and keep your interest for at least the first few hours, does it deserve to play in in the promise of something better in it’s later parts? As it stands, I do not see how it can improve as the core mechanics are what I find most unappealing. 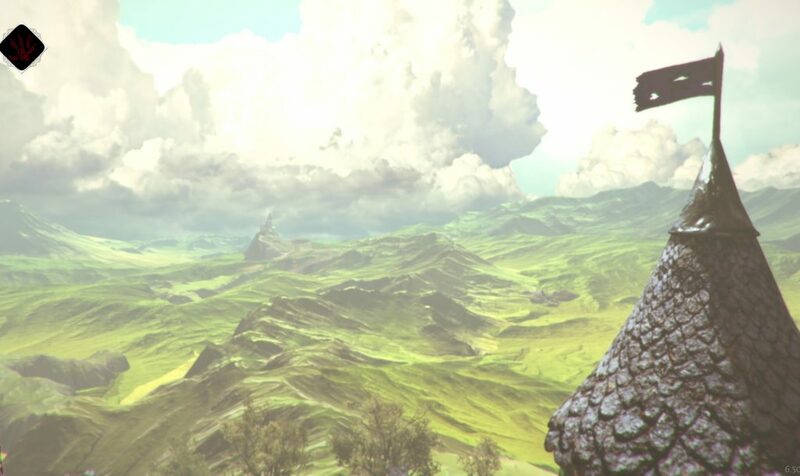 Maybe you will find something good in Ghost of a Tale and you will like it, regardless of all it’s flaws. Sadly, I couldn’t, no matter how hard I wanted to.